Our 13-inch Deck Rail Balcony Fence Planter offers a large planting space ideal for adding decorative accents to your outdoor environment. The Greenbo rail and deck planter box compression is designed for dimensional lumber and metal railings that are 1” to 4” wide (2x1, and 2x4 railings traditionally) for deck rails, patio railings and even fences. Greenbo rail deck and balcony planter box is clearly the best choice with its 100% 3 years Guarantee with proof of purchase, it is a RISK FREE purchase you shouldn't pass up. FITS ANY RAIL SHAPE AND SIZE - Compression fit design works with any type (metal or wood) or shape (oval, square, round) of rail whose size is between 1" to 4" deck rails, patio railings and fences. 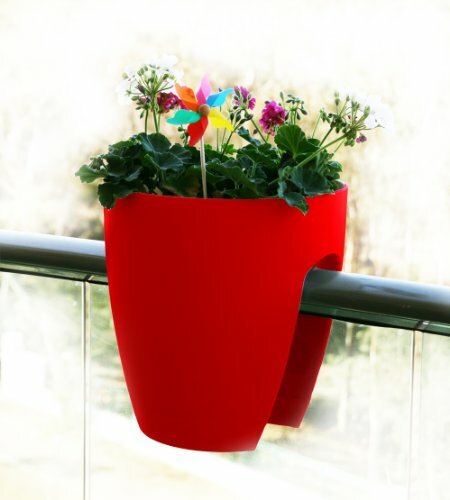 100% WEATHERPROOF - The Greenbo over the rail Planter is made from durable, weatherproof resin construction. It can resist any kind of weather, as well as the harsh temperatures of summer and winter. Unlike other rail planters, this resin planter won't crack when exposed to extreme weather conditions. EASY INSTALLATION-Self-mounting -- no screws, brackets or other hardware necessary.